As we’ve said in numerous engine swap posts, old SHO engines never die. They go from a dead Taurus into something that died a well-deserved death of its own, something that in almost every case needed a much better engine than the one it originally came with. That’s the strength of Ford’s Yamaha designed and built V-6 engine – it’s worth keeping. Today’s example is a swap into a 1979 Triumph TR7. The TR7 was Triumph’s last attempt to modernize the classic British sportscar. But despite the thoroughly modern and aerodynamic “doorstop” styling, the fatal mistake was in continuing to use a British engine and transmission along with “classic” (aka inherently and hopelessly flawed) British electronics. And to have it bolted together by a radical left-wing British Labor union that all but killed car production in Britain. It was therefore doomed from the start of its production in late 1974 to the demise of the brand itself in 1981. An d what an ending, given the late addition of a V-8 engine to produce the TR8. 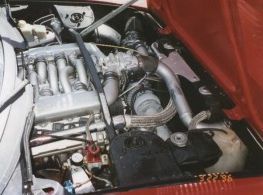 The 3.5 liter Rover-sourced V-8 engine (formerly a mid-60s GM unit) was a step in the right direction, but many problems remained – especially cooling. Nonetheless, the V-8 version is the one to look for: only 2500 were built. Early versions were carbureted, and should be avoided like the plague. Later editions were fuel injected, and worked better despite the rest of the car. Look for a different hood on the fuel injected version, with a mildly raised section to clear the intake. TR7s and TR8s immediately went into competition across North America, with successes in everything from autocrossing to SCCA Pro racing and even as an entry into Pro Rally. This author was lucky enough to see John Buffum in his pre-Audi days at a couple of Susquehanna Pro Rallies in Pennsylvania as he was on his way to winning the championship for 4 years straight in his TR8. We fondly remember his TR8 impatiently idling at the start of the stage we managed, every bit the V-8 burble, then showering us with rocks as he took off and disappeared into the night. Yes, fondly – every encounter with Buffum in those days was a great one to remember. This brings us to our example below. You can read the full story here: http://www.team.net/TR8/Conversions/SHO.html. What to do with an old TR7 and an SHO engine sitting at a nearby engine recycler? The result is below. And how about that spare turbocharger? Throw it into the mix! That’s how the mind of the swap enthusiast works and this TR7 is certainly a great example.